12 n Performance & Hotrod Business n May 2015 Aeromotive Fuels IHRA Fuel delivery system company Aeromotive Inc. has signed an extensive marketing agreement with the International Hot Rod Association that includes being named the presenting sponsor of the IHRA Nitro Jam Northern Nationals, Aug. 7-8 in Martin, Michigan. The IHRA Nitro Jam Northern Nationals presented by Aeromotive will include a full lineup of profes- sional and Sportsman classes including Crower Pro Modified, accord- ing to an announcement. In addition, Aeromotive becomes the official fuel systems of the IHRA, along with a category entitlement package that includes becoming the presenting sponsor of the ultra-competitive Amsoil Funny Car class. "Steve (Matusek) and Vic (Moore) at Aeromotive have taken a big leap of faith with the IHRA brand," said Scott Gardner, IHRA president. "We are truly happy to have Aeromotive join our rapidly growing family of partners. Aeromotive truly epitomizes the high quality standard of marketing partners we look for." In addition to the naming rights, a special Racers Program will also be created, the company added. The Aeromotive Racers Program will reward $200 to one professional class and one Sportsman class at each 2015 Nitro Jam National event. "When we were reviewing opportunities for our brand in 2015, IHRA wasn't even on our radar. 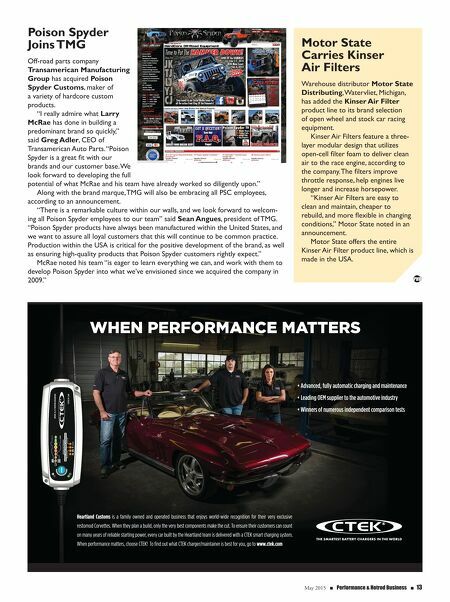 But after attending their press con- ference at PRI and experiencing the passion and excitement the rac- ers, sponsors and executives displayed for the IHRA, I felt that this is an organization that gets it," said Matusek, Aeromotive founder and president. Fidanza Updates Website Designed to better showcase parts, deliver improved product and technical information and provide a better user experience for its customers, the Fidanza Performance website has an all-new look. "Featuring easy-to-read text, engaging graphics and multiple ways to find and get to important information, the new www. fidanza.com will be a 'first-click' choice for consumers and automotive profes- sionals alike," the company said in an announcement. "The new site was devel- oped with ease of navigation in mind." It utilizes traditional drop-down menus and intuitive click-through links that allow users to access more in-depth Fidanza Performance product information and resources. Other features include an enhanced FAQ page, Google Maps- powered Dealer Locator (both U.S. and international locations), downloadable product instruction PDFs and all-new vehicle photo galleries, among others. 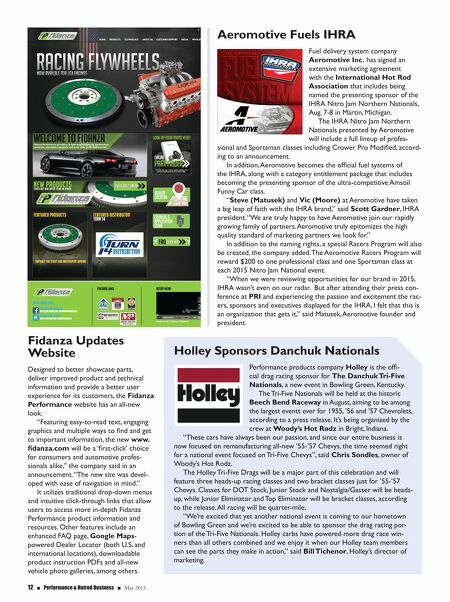 Holley Sponsors Danchuk Nationals Performance products company Holley is the offi- cial drag racing sponsor for The Danchuk Tri-Five Nationals, a new event in Bowling Green, Kentucky. The Tri-Five Nationals will be held at the historic Beech Bend Raceway in August, aiming to be among the largest events ever for 1955, '56 and '57 Chevrolets, according to a press release. It's being organized by the crew at Woody's Hot Rodz in Bright, Indiana. "These cars have always been our passion, and since our entire business is now focused on remanufacturing all-new '55-'57 Chevys, the time seemed right for a national event focused on Tri-Five Chevys", said Chris Sondles, owner of Woody's Hot Rodz. The Holley Tri-Five Drags will be a major part of this celebration and will feature three heads-up racing classes and two bracket classes just for '55-'57 Chevys. Classes for DOT Stock, Junior Stock and Nostalgia/Gasser will be heads- up, while Junior Eliminator and Top Eliminator will be bracket classes, according to the release. All racing will be quarter-mile. "We're excited that yet another national event is coming to our hometown of Bowling Green and we're excited to be able to sponsor the drag racing por- tion of the Tri-Five Nationals. Holley carbs have powered more drag race win- ners than all others combined and we enjoy it when our Holley team members can see the parts they make in action," said Bill Tichenor, Holley's director of marketing.